Sooo I had my first day of preseason today! And I passed the fitness test! We have two more fitness tests to pass and today's was the easiest. But I'm not worried ;) Weirdly enough, I actually enjoy preseason. Although the practices are loooong, and we have to pass fitness tests, and do pushups/crunchs/planks, and we do lots of boring drills, and it starts at 8 in the morning....yep, even after all of that I still like it. I'm weird like that. I'll be back with another post when** I've passed the next two fitness tests! I adore your dress!! That color is so gorgeous and the dress just looks amazing on you! I love this look! Coral with black and white is one of my favorite combos!! This is so cute! I love how that jacket matches your shoes so well... such a cute way to pair black and white with a color! This might be one of my favorite outfits of yours, you know that? Yup yup! There's so many cute details going on here! Good luck with the tests! I love your shoes. Cute outfit. Such a cute look! Loving your dress! The color is great! Oooh I love the coral plus stripes combo! I love your shoes, they are gorgeous!! I love this whole outfit but especially that blazer! Super cute! That color dress is absolutely amazing! I really love it! Oh my goodness, your shoes are AMAZING! Glad I found your blog! Hey you blog is really cool! I also just started my own blog! :) If you like, take a look! I love the colors and stripes! Glad you enjoy it, it makes it so much more bearable to get through. Plus, if everyone has an attitude like yours preseason will be great! 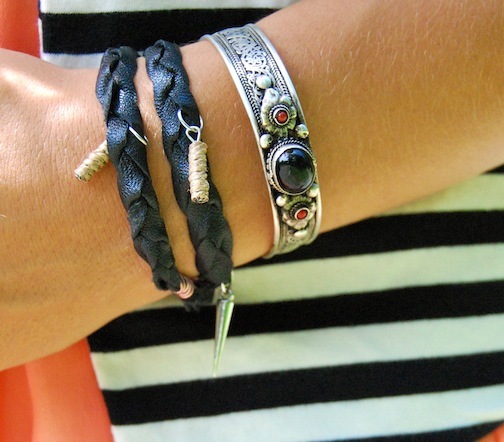 Loving your mixing of stripes! Love that striped blazer! Looks so pretty with the coral dress! gorgeous outfit! love your blog! Wonderful outfit!We adore your dress!!!!!!!!! Nice summer look!You are so cute! good luck with your next tests! Love the stripes with orange!!! Very cute look! I love the combination of orange and stripes! I love the color of that dress! Beautiful! i don't know anything about school sports haha. preseason, huh? :P but hey you look lovely in peach and stripes, i really like the combo!!! 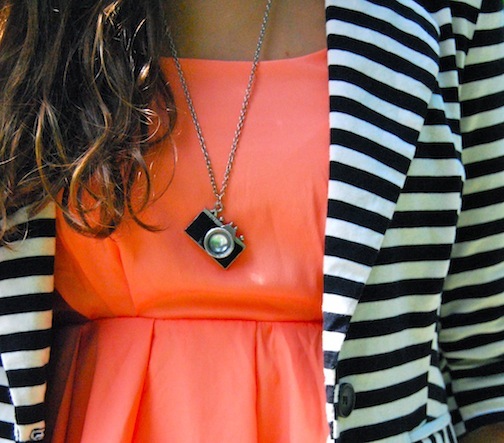 and that camera necklace, so cute! !